David is one of the activists explaining the Pacific salmon crisis in the first two films. This powerful film odyssey across America explores the sea change in our national attitude from pride in big dams as engineering wonders to the growing awareness that our own future is bound to the life and health of our rivers. Dam removal has moved beyond the fictional Monkey Wrench Gang to go mainstream. Where obsolete dams come down, rivers bound back to life, giving salmon and other wild fish the right of return to primeval spawning grounds, after decades without access. DamNation’s majestic cinematography and unexpected discoveries move through rivers and landscapes altered by dams, but also through a metamorphosis in values, from conquest of the natural world to knowing ourselves as part of nature. Learn more. The parallel stories of collapsing Pacific salmon populations and how biologists and engineers have become instruments in audacious experiments to replicate every stage of the fish’s life cycle. Our once great runs of salmon are now conceived in laboratories, raised in tanks, driven in trucks, and farmed in pens. Here we go beyond the ongoing debate over how to save an endangered species. The film is available through PBS or you can view it on YouTube. Coursing from the verdant hills of Southern China to the sparkling streams of Montana, Trout Grass is a story of passion, international partnership and the discovery of place in our natural world. This unique documentary captures the 10,000-mile journey of bamboo’s transformation from a hardy species of grass to a super-conductive split-cane fly rod. The film tracks Hoagy Carmichael on his first visit to China where he experiences the country’s mystical bamboo forests. As a legendary split-cane fly rod craftsman and author of the art’s seminal study, these far-off lands have fueled Hoagy’s dreams for 40 years. Next, we meet master-builder Glenn Brackett, who taps into “the power of unseen hands” in his Montana shop while converting this hardy piece of grass into a stunning and responsive river wand. 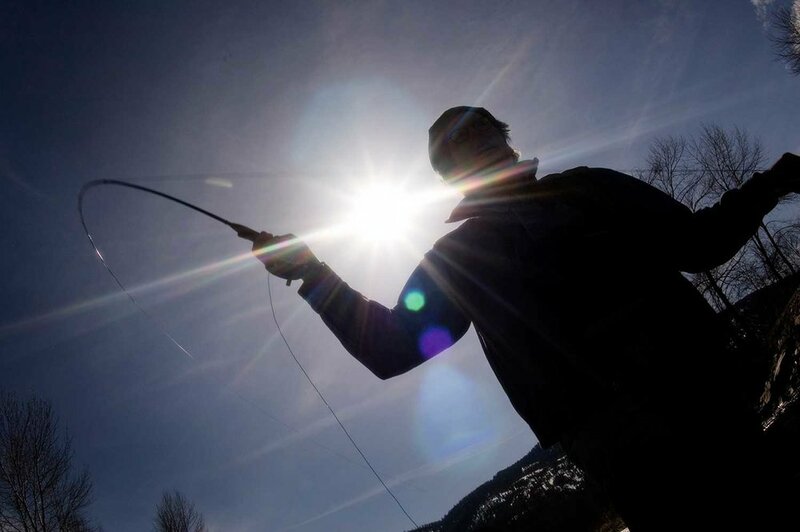 Out on Rocky Mountain waterways, narrator David James Duncan and fly fishing legend Thomas McGuane reveal the magic of fishing with a fly rod made of grass and connecting with the order of rivers and flowing things. Go to the official film site – Trout Grass – for more information and trailers and to Netflix to rent Trout Grass on DVD.